Bill is moving in with some friends and they’ve found the perfect house – so what if it’s strangely cheap to rent, and the landlord is a little creepy? The wind blows, the floorboards creak and the Doctor thinks something is very wrong. What lurks in the strange tower at the heart of the building – and why can’t they find any way to enter it? * David Suchet (Agatha Christie's Poirot) gives a wonderfully understated performance as the Landlord in this episode. He agreed to the role without reading the script. * "Knock Knock" was written by a newcomer to the show: Playwright Mike Bartlett, creator/writer of the British medical drama Doctor Foster (See the sidebar in that link for videos of the full first season.) The screen adaptation of his play King Charles III will air on BBC Two next Wednesday. * Bill's friend Harry was intended to be the grandson of classic Doctor Who companion Surgeon Lieutenant Harry Sullivan. The line explaining this was cut from the episode because the writers thought people "might not remember one companion from 40-odd years ago". * This episode used the same stately manor as "Blink" and "The Snowmen." * Presented online in an immersive binaural audio format. The Doctor: "Bill, I'm a Time Lord." Bill: "Time Lord? What's that, your job?" The Doctor: "No, it's my uh... my people. My species." Bill: "Doesn't sound like a species. Sounds posh. Like 'Yes, my lord.' Doff my cap." The Doctor: "Ah well, that's why I gave it up. Ran away." Bill: *laughs* "Time Lords. That's hilarious. Do you wear robes and big hats?" The Doctor: "No. Big collars, mostly." The Doctor: "It doesn’t help." The Landlord: "Hope is its own form of cruelty." The Doctor: "New friends and fireworks. That’s what life should be." Bill, to The Doctor: "This is the bit of my life you’re not in." Nardole: "Bill told me you went on a little adventure. You see?" The Doctor: "'I see,' what?" Nardole: "Well, you don’t have to go to outer space to find monsters. There’s plenty of things that want to kill you right here on Earth." Nardole: "A piano? You've put a piano in there? Why?" Nardole: "Oh, you don't learn, do you, sir?" Pearl and Peter are just the best. The Doctor has a picture of Susan on his desk and Bill referred to him as her grandfather. I would love some eventual payoff for that. The Time Lords (yes, he specifically used the plural) dialog felt like foreshadowing - either there's another Time Lord in the vault, which seems a bit on the nose (especially if it's Missy), or the season finale will revolve around multiple Time Lords. Maybe Gallifrey returns? I really am properly enjoying this series. A student house that's literally made of bugs is such a fantastic concept! Im really hoping the grandfather thing pays off, too. Interesting that the story has the landlord and his mother forgetting their relationship- I feel like that might be a hint towards something as well. I would have loved the Harry Sullivan reference to make it but you can't have it all, y'know. I'm not the biggest Tom Baker fan (u know, I know, blasphemy) but the eps with Harry and Sarah Jane are joyous things. A warning for those reading comments before seeing the episode - the David Suchet interview has some very spoilery pictures. I was a bit surprised at the explanation for the Harry Sullivan reference being cut, as he's been referred to twice in NuWho and its spin-offs. It seems to me more likely that this season, which is quite consciously 'back to basics' as regards Who lore, is focussing continuity and backstory references on plot points that are either important for completely new viewers, or relevant to the 'who is in the vault?' plot arc. Bill makes it clear to the Doctor that he is part of her life, but not the whole of it. This is much more the sort of Doctor/Companion relationship that has been depicted recently, with Clara, and Amy and Rory before her, shown as living their own lives that the Doctor would crop up in, rather than the more traditional model of a Companion as someone who gave up his or her day-today life for a while* to travel with the Doctor. That said, there were a number of recurring Classic Who characters (and one canonical Companion, Dr Liz Shaw) who were colleagues of the Doctor when he worked with UNIT**, so it's not an entirely new idea. *Or permanently, if they ended up in another time period or world, or in the odd case, died. **In the 1970s. Or was it the 1980s? He gets a bit vague about that. Not really a DW fan, but I really like Bill, so I'm sticking with watching the episodes that aren't too space-y. Bill is awesome. Bill is likable and charming. I want to know more about her. I love that she seems like a relatively normal person, and not a 'chosen one'. I hope she gets a girlfriend soon. A bit formulaic - "ghosts? no it's aliens" and "talked bad guy out of being bad" - but otherwise a fun episode. Creepy noises were creepy. Bill is cool, and I like the "OK Doctor, you can go now, I want to hang out with my student pals and I'm not obsessed with you like past companions" dynamic. Interesting that the story has the landlord and his mother forgetting their relationship- I feel like that might be a hint towards something as well. So far, every episode this season has had a missing, dying or deceased mother (or in the case of Thin Ice, parents) as a plot point. * The Pilot had Bill's box of photos from her mom. And the first thing she did when she found her room in this episode was hang a photo of her mom on the wall, and say to it, "Here you go, Mum. My own place. You proud?" * Knock Knock's ending. Which included this line from the distraught Landlord: "If you could save the one who brought you into this world, wouldn’t you?" The camera immediately cut over to Bill, in tears. This has to be significant. They're telegraphing it too strongly for it not to matter. Loved seeing David Suchet. There's an actor who should have been a Doctor. I'm finding the vault thing more and more confusing. When we first see it, it's pretty clear that both the Doctor and Nardole are working on how to open it. Now, in this episode, we see that the Doctor has a key for it. So, why deceive Nardole (and keep him working of breaking the lock) if you can already open it? And, yeah, it's probably one form or another of the Master inside. I enjoyed this episode, but a couple things bothered me -- the bugs get fed every 20 years, but the whole thing started 70 years prior. For one thing, why every 20 years? And another, 70 is not divisible by 20. The ending was a bit of a brush off .. are all those billions of bugs are just loose in the world now? Why were all the students upset that their rental place was gone when it just tried to eat them? Seemed like an odd reaction. Why were all the students upset that their rental place was gone when it just tried to eat them? Have you tried getting cheap accommodation in London? 70 years was: 10 years figuring out how to control the bugs (not easy, especially as he keeps getting carted off to boarding school), ending when he turns 20 and inherits everything (possibly the first successful test run of the bugs). Then, 3 cycles of 20-year sacrifices, ie two successes and a failure. Because it gives Nardole something to do and keeps him out of the Doctor's hair, thus allowing the Doctor to break his oath. Although it was odd that Nardole was all "You put a piano in there?" That indicates that Nardole knows the Doctor can get in. Maybe they were checking that the lock was secure, not trying to open it. And yup, I'll be shocked if it's NOT Simm in there. I liked how David Suchet portrayed the landlord's emotions when Eliza is revealed to be his mother and he speaks to her as her son for the first time in decades - he added a simple child-like sound to his voice without getting cutesy or being overly precious. Very well done. 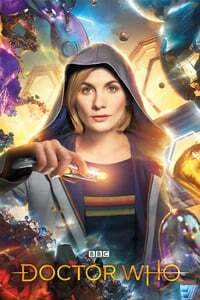 Finally catching up with this season and I'm enjoying it (though I don't have as big an issue with Moffat and/or Capaldi as some Mefites seem to have). I feared Bill would be gimmicky but she works and is pretty good. The vault? I assume a time Lord is in there either the master (remember the master imprisoned in the Sea Devils watching the Clangers?) or his new regeneration. All that mother stuff zarq points out has got to be something. Hard to say what... maybe the Doctor finds Bill's mum? Maybe we'll get a regeneration of Susan? Guy Zero said the oil in The Pilot seemed a bit overpowered. The same is true for the insects here: they can reassemble a human. Perhaps that's a thing for this season. All that mother stuff zarq points out has got to be something. Calling it now: the vault contain's the Doctor's mum. I'll lay my cards and say I don't think it's the Master/Missy, but they are Gallifreyan. And Smile had a city that was literally made of nanobots. Is this a common theme, or simply an accidental similarity? I found this one underwhelming, and I think I just realized why: I wasn't convinced that the group were students. They felt too much like they were playing lines written and directed by middle-aged men for Generic Young People Characters. The Moody One; the Crushy One; the Laddish One. They get away with this for Bill to an extent because I don't think we've actually been told how old she is. She works at the college and isn't a student until the Doctor starts tutoring her, so she's as old as the audience decides to project onto her: twenty-something? But the rest of them being "students" suggests 18-21; and I just didn't buy it. Also: too much leaning on creaky-house-noises-are-scary and too much lampshading of there's-something-important-in-the-tower. The ending was a bit of a brush off .. are all those billions of bugs are just loose in the world now? And yes, this too. What happens to the bugs now? What happens to the bugs now? When the piano started playing and the Doctor went into the vault for some takeaway and a chat, I realised what the Vault reminds me of. It's the Sherrinford plot from Sherlock: a build-up of mystery around an unbreakable(ish) prison, monitored by one of the protagonists, which turns out to contain a manipulative genius with whom the hero has an intense and storied love/hate relationship. It'd hardly be the first time that Who and Sherlock have had very similar plots cropping up. My money is solidly on the vault containing some incarnation of Missy/Master.